As an Enterprise Resource Planning IT trainer at the U, Yanatha Desouvre dedicates his time to creating content, studying it, and facilitating training sessions for faculty and staff throughout the University. His path in IT began as a hobby, born out of a need to figure out how to fix a constantly crashing computer game as a child. "Success comes with support. We fail in this life when we fail to uplift one another"
If my late godfather Daniel Coulanges knew his status he might have been alive today. Experience the Daniel Coulanges story. 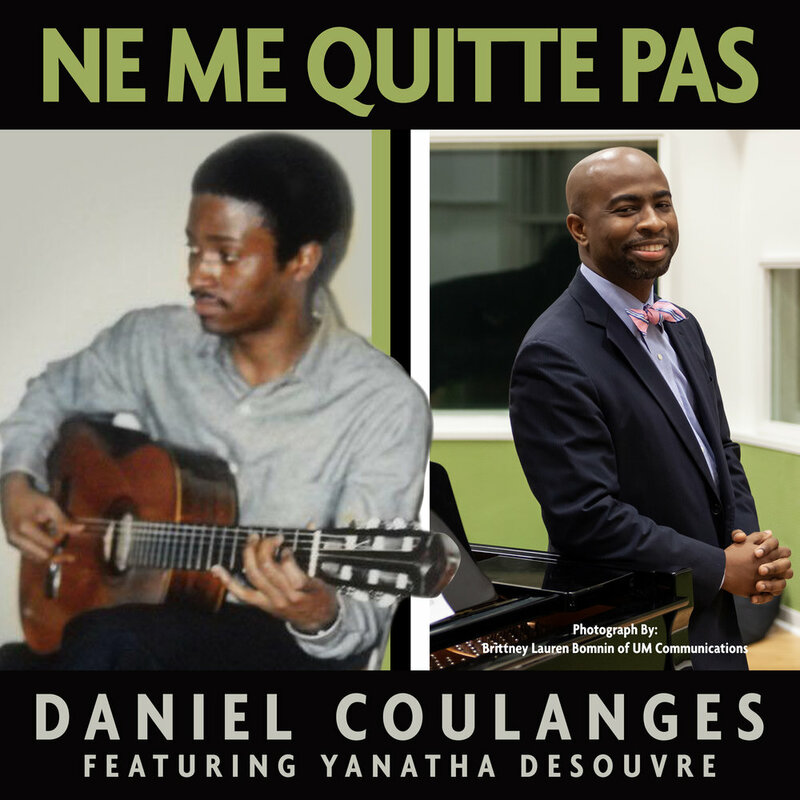 "Besides his literary endeavors, the author is also working on a personal project—that of bringing the work of the late guitarist Daniel Coulanges to a wider audience"
Miami, Florida – Monday April 1st, 2019 Haitian American artist and Miami resident, Yanatha Desouvre, records a cross-generational duet of Jacques Brel’s Ne Me Quitte Pas (recorded in America by Nina Simone and Wyclef Jean), with his late uncle Daniel Charles Coulanges, who was once introduced as of the ‘World’s Finest’ classical guitarist. Coulanges died of HIV/AIDS at the tender age of 28 on April 30, 1989 only two years before Magic Johnson made his announcement. This dynamic family duet that has been 30 years in the making was recorded at the University of Miami Frost School of Music L. Austin Weeks Recording Studio, home to the three Grammy Award winner John Daversa. In addition to the duet, with the lost footage from his late uncle, Desouvre, through Indiegogo pledges, has brought to life the music of the late Daniel Coulanges, with the 18-track album titled ‘World Finest’ (Pre-sale available April 1st) on Sale and Streaming on April 16, 2019 on iTunes, Google Play, Spotify, Apple Music and more. Miami-Dade County, which Care Sources indicates is the number onecounty in Florida for new cases of HIV. Desouvre is using Coulanges’s music to raise awareness about HIV, encouraging everyone to know their own HIV status. In Daniel Coulanges’s musical masterpieces you will find yourself immersed in France, South America or in an intimate cafe in San Francisco, Miami, New York, Philadelphia, Pétion-Ville, Port- au-Prince, London, Barcelona, Hong Kong, Tokyo, and so many places around the world. The late Daniel Coulanges's timeless classical guitar music with a global, upscale, and exquisite sound will be available for you to enjoy. His music has been remastered and produced has opened listeners’ eyes, ears, and hearts to the music, while nudging them to learn their HIV status. Celebrate with Desouvre as his brings Coulanges’ newly found recordings to life by visiting www.yanatha.com. All proceeds from the album sales and donations will go towards establishing and funding the Daniel Coulanges Memorial Scholarship Fund. New Haitian Generation - Yanatha Desouvre has a heartwarming and remarkable story about one of the world’s finest guitarists Daniel Coulanges. Yanatha is using Daniel Coulanges music to raise awareness about HIV, encouraging everyone to know his or her own HIV status. Desouvre, is a best selling author, marketing professor, performance poet and a recent TEDx motivational speaker who will immediately capture your audience’s heart and mind while positively impacting their lives. His determined, distinctive yet very simple approach on life will resonate with the audience long after his program has ended. He’s an engaging figure who wide range of audience types loves to hear from. Desouvre has a list of credentials in the Spoken Word and Literally community and he is humbled by every opportunity that he has been given to share his work and inspire others. Desouvre is a seasoned IT professional who has successfully incorporated his IT expertise into his creative work. As a season spoken word poet, entrepreneur, motivational speaker and as a best selling published author, it will be an honor for Desouvre to share his experiences and simple ways to your group on how to empower themselves to reach their full potential. For twenty plus progressive years Desouvre is passionate about serving others through technology and the arts. Desouvre supports multiple platform environments, Mac, Win, iOS, Android throughout his technical career. Desouvre is well versed on how iOS devices work for Education and Business. Desouvre had created several successful mobile apps. He has been mentored by and has mentored some of the best in the IT and entertainment industries. Yanatha Desouvre, a prolific author, was born in Port-au-Prince, Haiti, reared in Brooklyn, N.Y., and Philadelphia, P.A. Desouvre is a seasoned IT professional. With his practical, and relevant teaching philosophy Professor Desouvre has taught IT courses at Chestnut Hill College which led to him write the textbook, An Essential Guide to Windows 10. He also teaches Principles of Marketing and Marketing in a Digital World at Miami Dade College. Other books written Desouvre are: “Walk Through this Journey: Volume One and Two (The Next Step Forward);” “A Family Affair;” Savor the Moments, Proud to Be, To Whom Much is Given, Revelations: Roads to Redemption and his number one best-selling children's book “Big Sister, Little Sister, (also available in French, Spanish and Haitian Creole)” now on amazon.com. Professor Desouvre released the “Walk Through this Journey: Volume One” and Savor the Moments audiobooks, available through iTunes, Google Play, and various other online musical outlets. Specializes in Higher Education, HDI Certified, Dell Desktop & Laptop Certified, Developed for Google's Android and Apple's iOS Expert on the macOS (10.x-10.11.x) and MS Windows 7,8, and Windows 10, Ubuntu Linux, Group Policies Voice/Data Networking, Backup devices, Adobe and Office Suites, Exchange Symantec Ghost. Help Desk Supervision, MS Active Directory, BlackBoard SCCM and ITIL.